They say there’s one question a film noir has to answer right away, and that is: Why don’t they call the police? That would be the normal thing to do if, for instance, you stumbled upon a victim of a violent crime. However, if movie characters went to the police each time someone was murdered/robbed/blackmailed, we wouldn’t have a very interesting selection of crime dramas, would we? Here’s where film noir makes things interesting. In film noir, people can’t go to the police. The only way to solve their dilemma is to face it themselves – as grim a task as that is. A film noir world is a place where you don’t know who to trust, and people aren’t always what they seem. 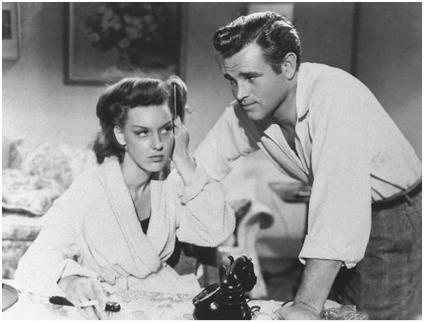 This is the case in Detour (1946), a paranoid, nothing-goes-right film about a man (Tom Neal) who wants only one thing – to travel from New York to Los Angeles to marry his fiancé. As is the case with many good noirs, the film is told in flashbacks and we are gradually led to discover a gritty and desperate situation. As he starts to hitchhike across the country, Neal is picked up by an amiable “travelling salesman” (Edmund MacDonald). After driving for the better part of a day, MacDonald asks Neal to take the driver’s seat while he sleeps. Aww – ain’t this sweet? Neal drives and MacDonald has a lovely little nap, resting comfortably against the passenger door. Just two buddies travelling down the open road. One key characteristic of film noir is the plot twist, and Detour has plenty of those. The first occurs when Neal stops the car and opens the door against which the sleeping MacDonald is slumped. MacDonald spills onto the ground, slams his head on a rock and dies instantly. Well! If that weren’t awkward enough, it turns out MacDonald was a rather unsavoury character who has a lot of cash in his wallet, and we mean a LOT of cash. Neal is in a quandary but, in true noir fashion, he does not wait for police. How come? First, he’s on a highway in the middle of nowhere. Second, he’s convinced police wouldn’t believe him – and he’s probably right. Here’s a hitchhiker, alone with a dead man and a wallet stuffed with cash on a deserted highway. Nah, nothing suspicious here. Yikes! How on earth does she know? By now, we are completely immersed in the world of film noir. Neal can’t go to the police because Savage has made it clear she will testify against him. He also can’t escape Savage’s clutches because, like every good femme fatale, she has a very controlling personality. He is alone must solve his predicament, if he can. It’s obvious that Detour was filmed on a budget, as some of the most notable noirs are, but it doesn’t interfere with a gripping story. The camera work is top-notch and the performances by Neal and Savage are outstanding. The script, too, is water-tight and it delivers a gasp-out-loud twist near the end of the movie that you will not believe. You may or may not agree with the film’s overall philosophy, which is summed up in a single statement just before the closing credits. But you won’t forget Tom Neal’s desperation in a film noir world or his inability to summon police when he needed them most. Detour: Starring Tom Neal, Ann Savage, Claudia Drake. Directed by Edgar G. Ulmer. Written by Martin Goldsmith. Producers Releasing Corp., B&W, 1946, 67 mins. Oh R.A., I am so in love with the way you write….the way you tell the stories of these movies. My heart literally starts to race a little! Crazy, I know, but true. I have Detour on the DVR, but I’ve yet to watch it. I must watch soon. What is it with me and Noirs lately anyway? Love them! Thanks, Sarah! This really is a terrific film. It is low-budget but don’t let that deter you; the script is SO well done. If you’re in a noir frame of mind, you’ll like “Detour”. Dor, this is one that deserves a person’s undivided attention. The script really pulls you in and gives you a sense of panic and desperation. I just love movies with plot twists and turns. You had me on the edge of my couch when I was reading your description. I’m putting it on my list of movies to watch. Thanks for the recommendation! This movie is chock-full of twists. You will not be able to predict what comes next, I guarantee! This is just one of the best movies of the 1940s, low budget or no. And Ann Savage is the bomb. Ann Savage IS the bomb. She is amazing in this movie. I’m not that familiar with her filmography, but I am now a huge fan. This is the best thing she ever did (although The Last Crooked Mile is wonderful, too) but she was always first-class. You do such a wonderful job with these films and make me want to see everything you write about. Great job! Thanks so much! 🙂 I think this is one you’ll really like. The tension increasingly builds throughout the movie until you almost can’t stand it anymore. You can’t trust the cops. You can’t trust nobody. It’s a dark, twisted, hopeless world. It’s noir, baby. And don’t we love it? You bet – we do love it! This is one of those cult classics that lives up to its reputation (the scene with the telephone cord is a stunner!). You’re right, in film noir, you can’t go to the cops–no matter how bad the situation! That telephone cord scene is one you never forget, hey? Brilliantly done. Great synopsis! Makes me want to watch Detour — admittedly, I’m not up to snuff on my classic movies, but your blog always inspires me to brush up! Thanks for stopping by! “Detour” is not a well-known film. 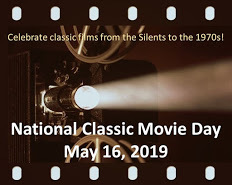 In fact, I hadn’t heard of it until a couple of months ago, and I BLOG about classic movies! If you have a chance, you should check it out. I have never heard of this film! And I’m not familiar with any of the stars in it. But I love film noir, and this sounds like a great one. I am going to be on the lookout for this. Thanks for brining it to my attention. Thanks, Patti! The actors in the film are not as well known as some from the period, but I think you’ll become an instant fan. Ann Savage is especially good here.